Pax Earth exists for education, environment and empowerment. It is committed to a clean, green and sustainable environment and has been performing its duty to nature by involving in tree plantation time and again. 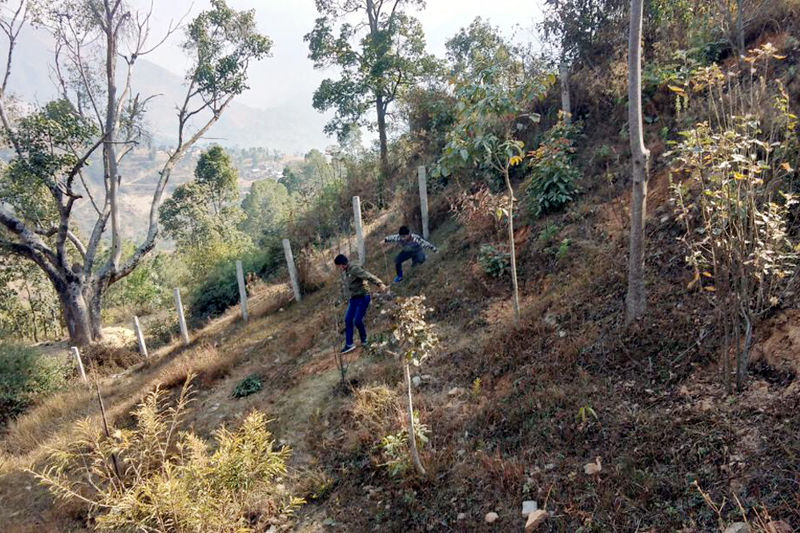 The Pax Earth has been planting wild and fruit trees at the premises of Shree Raktakali Primary School, Shree Kalika Primary School and Shree Seti Devi Primary School located in Namobuddha Municipality, Kavre for the last seven years. Effort of the Pax Earth is not limited to quantity of trees being planted like many organisations are content with but is more focused on their survival. Hence, the effort is on taking care of the planted trees and plantation areas. 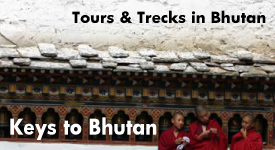 Although the organisation has been extensively involved in tree plantation, the momentum was apparently interrupted after the great earthquake hit Nepal in 2015. The impact was severe that the school buildings of Shree Raktakali Primary School and Shree Seti Devi Primary School were destroyed. And, in order to build a new building in each school, the plantation area was cleaned to maintain the level of the surface which costed hundreds of (wild and fruit) trees taken care for several years. This has become a major blow in Pax Earth’s tree plantation history. The earthquake did some damages on the school building at Shree Kalika Primary School but magnitude was not as severe as in Shree Raktakali Primary School and Shree Seti Devi Primary School. Hence, our several year’s of tree plantation effort is visible at the premises of Shree Kalika Primary School only. About fifty wild and fruit trees have survived in this school. In order to offset the lost but important effort, the Pax Earth team came up with an idea of creating a fruit garden at these schools. Accordingly, we created a garden plan in June 2018 and began to implement it at the premises of Shree Raktakali Primary School planting some fruit saplings such as orange, pomegranate, mandarin and avocado on July 22, 2018. 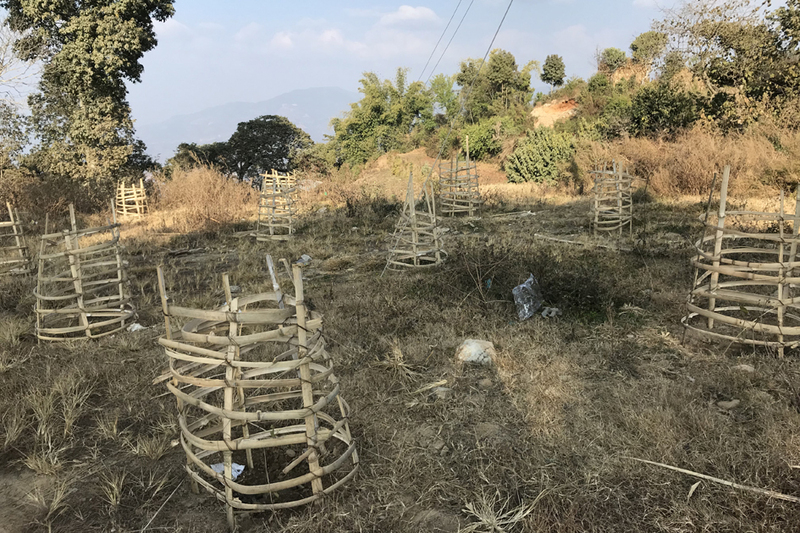 In January 2019, after six months of initiation, the Pax Earth could implement the garden plan at Shree Seti Devi Primary School and Shree Kalika Primary School by planting some fruit saplings. 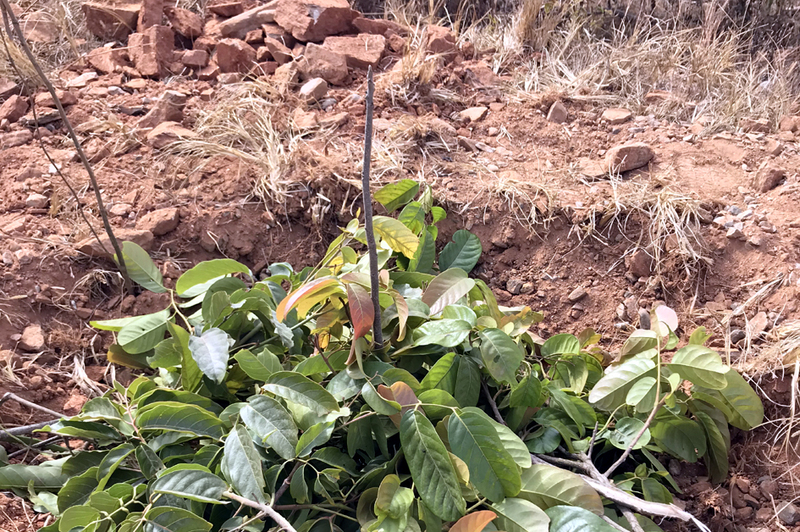 Although there are many (wild and fruit) trees, we added some fruit plants at Shree Kalika Primary School from the perspective of turning the plantation area into a fruit garden in some years. 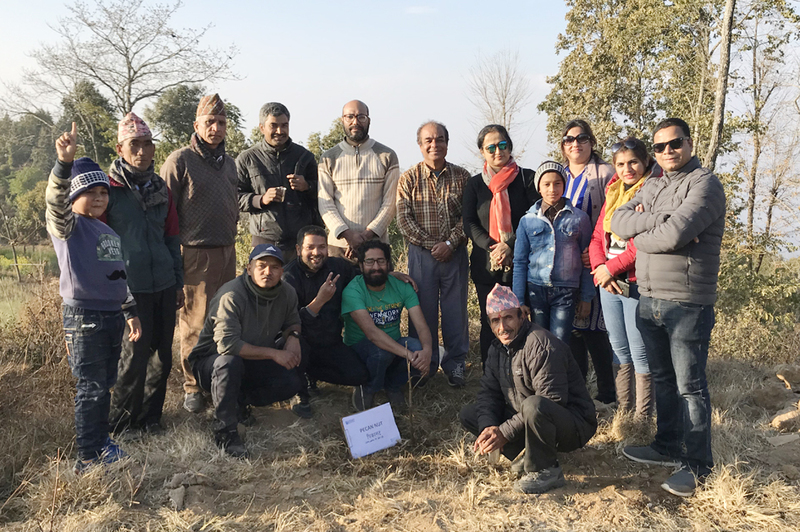 On January 17, 2019, a Pax Earth team led by president Sujan Koirala along with vice president Guna Raj Pyakurel, secretary Manohar Sapkota, members: Debraj Ghimire, Dev Raj Karki, Sital Mainali, Rajani Poudyal, Prabin Giri, resource person Ramhari Prasad Upadhyay, well-wishers: Dr. Ram Paudel, Samjhana Dhakal Ghimire, Anju Lamichhane, Pratik Ghimire and Prastab Ghimire traveled to Namobuddha Municipality, Ward No. 5 and planted 23 fruit saplings at Shree Seti Devi Primary School, Shree Kalika Primary School and Shree Raktakali Primary School in total. Main objective of the plantation is to create a fruit garden at each school and promote clean, green and healthy environment. 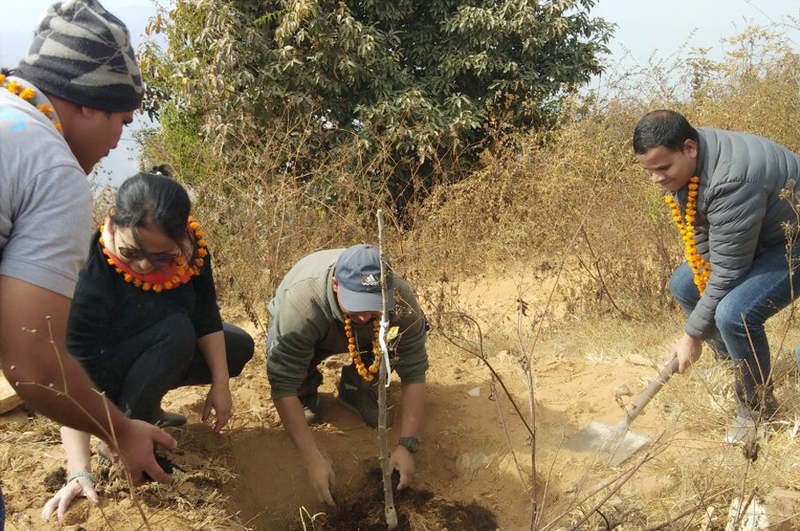 At Shree Seti Devi Primary School, with the support of the teachers, students and community people, the Pax Earth team planted fifteen fruit saplings: four apples, three persimmons, six pears and two pecan nuts as per the instruction of resource person and fruit development expert Ramhari Prasad Upadhyay. The team planted these saplings making 3/3 layers of ash, compost fertilisers and soil in the 3ft x 3ft holes. This was the first plantation at this school after the great earthquake in 2015. The school now has a new building in place of the old building which was destroyed by the earthquake. While constructing the new building, the whole area was cleaned which costed the trees the Pax Earth and the school had planted and protected for several years. After the plantation, the Pax team distributed a few useful stationeries such as note books, pencils, ball-pens, erasers and sharpeners to ninety underprivileged students. To add a sweetness, the Pax Earth team handed some chocolates too. 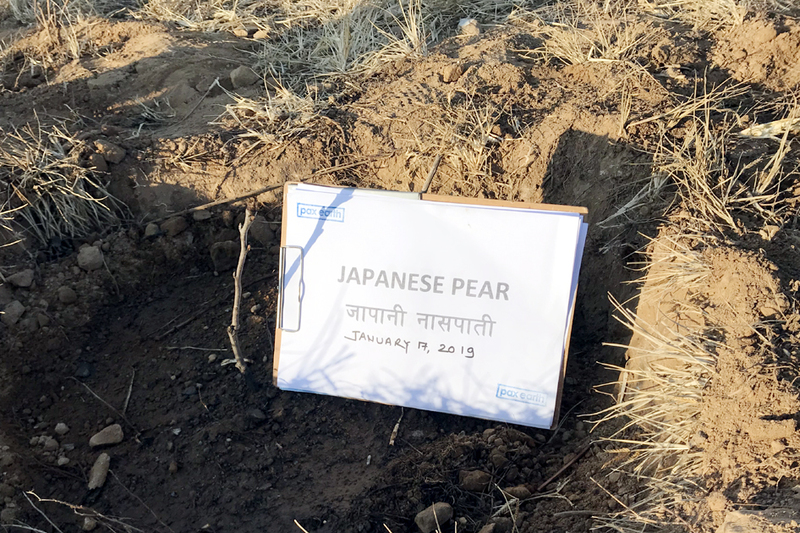 At Shree Kalika Primary School, the Pax Earth team planted three fruit saplings: two pears and one persimmon following the instruction of resource person Upadhyay keeping 3/3 layers of ash, compost fertilisers and soil in each 3ft x 3ft hole. Including, fruits and wild trees, total 50 trees have survived in this school in last 6 and half years. Two apple trees have already harvested about fifty pieces of apple last year. 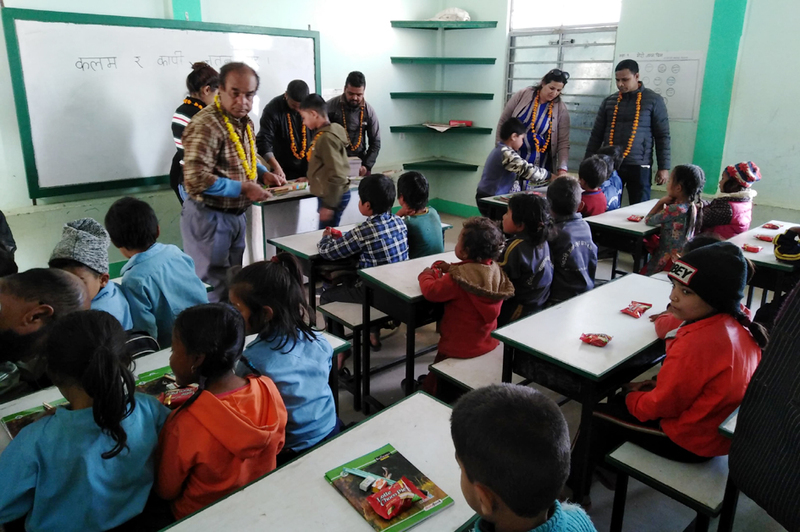 The team handed some chocolates to the students and teachers after the tree plantation program. 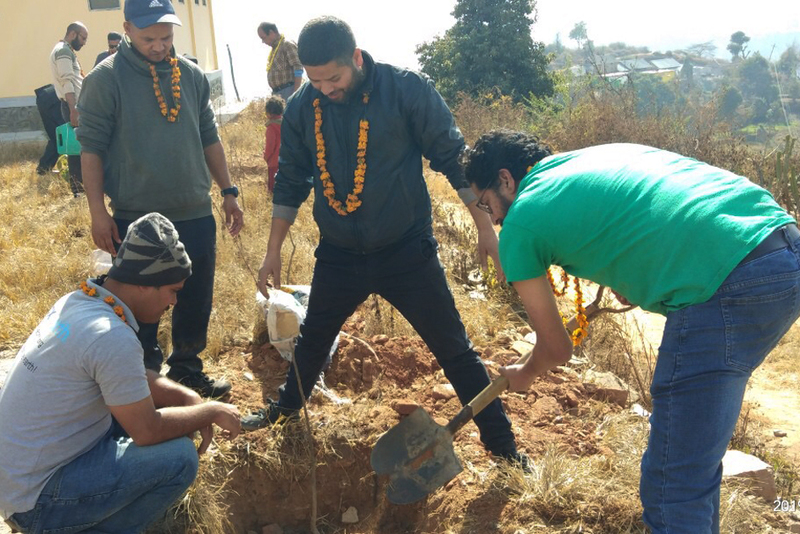 At Shree Raktakali Primary School, the Pax Earth team planted five fruit saplings: two apples, one pecan nut, one persimmon and one pear following the systematic procedure like in previous two schools. The school now has a new building in place of old building which was destroyed by the earthquake. In this school too, the whole area was cleaned to construct the new building costing several wild and fruit trees planted by Pax Earth before the earthquake. Considering the importance of tree plants and request of the school, the team conceptualized a garden project and planted 28 fruit plants in July 2018 and 25 of them have survived. The team handed some chocolates to the students and teachers after the plantation. Shree Raktakali Primary School has been facing a huge problem of arranging adequate drinking water for the seventy underprivileged students. This has made life very difficult at the school. To ease their pain, the Pax Earth contributed a small fund to buy water for the next three months. They were thankful to the Pax Earth for the support to buy water. They even showed commitment to use the waste water in watering the tree plants. Most of the fruit saplings are grafted root stock bought from Centre Horticultural Centre, Kirtipur. The grafted apple and pear trees will take three to four years to bear fruits while pecan nut and persimmon trees will take five to six years. The Pax Earth will conduct the tree plantation time and again until a fruit garden is created in each school. Along with this tree plantation program, the Pax Earth has attempted to support tree plantation beyond Kavre. Accordingly, the organisation has handed six fruit saplings to Peace Nepal Academy in Kathmandu to plant them in the school premises. 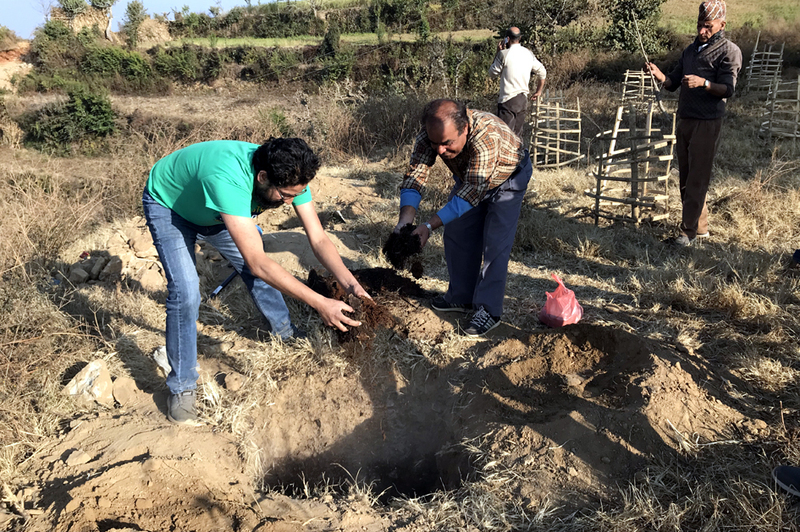 In addition, the organisation handed a few fruit plants to its members to encourage them to plant in their kitchen gardens in Kathmandu. The aim of the tree plantation is to create a fruit garden in each of these schools in three to four years. Our focus is on the survival of the planted saplings. Hence, we sought a strong commitment from the school authorities to take a good care of the planted saplings. Our effort will not only promote green and healthy environment at the school, but the students and teachers can enjoy fresh fruits once the tree started to bear fruits in some years. The Pax Earth believes that planting trees helps combat global warming and this very tree plantation is a token of contribution towards this goal. Yes, Pax Earth is committed to ‘duty to environment’ and will keep on planting the trees time and again in future. Pax Earth would thank the program team for successfully conducting the tree plantation and stationery distribution. We are grateful to Ramhari Upadhyay for arranging the fruit plants from Central Horticulture Centre. We are thankful to Pickworth Players, Lincolnshire, U.K. for their support for the stationery and drinking water. Their support will indirectly help in watering the plants too. We are equally thankful to honorary members Les Skidmore and Jane Skidmore for connecting Pax Earth with the Pickworth Players. We expect the similar support from the Pickworth Players in the days ahead. We must thank well-wisher Biswo Ram Basi for offering the Pax Earth team a smooth ride throughout the day.